Join Paddy Power today and bet on the EFL Cup match with Man United Enhanced Odds! 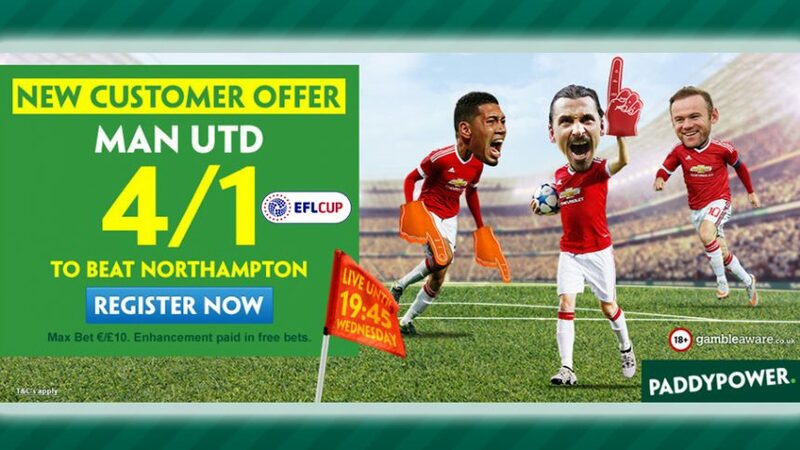 Place a £10 on Man United to beat Northampton in the EFL Cup and earn yourself an easy £50. Man United Enhanced Odds is valid until the game starts (19:45 BST, September 21), so make sure to place your bet on Jose Mourinho’s side before then to scoop five times your original investment! You’ll get your winning based on the normal odds on the site, while the other part of the winnings will be credited to your account in Free Bets, which will take the amount to the full 5.00 (4/1) odds with Man United Enhanced Odds! Note: Man United Enhanced Odds are only open to UK and Republic of Ireland players. The EFL Cup has traditionally been a competition in which big sides prefer to rest their key players and instead opt to give youngsters minutes on the pitch. Nick Wright from Sky Sports has outlined five players that could be given a chance by Mourinho to play in the EFL Cup tie against Northampton: Axel Tuanzebe, Tim Fosu-Mensah, Sean Goss, Joe Riley and Regan Poole. But despite the likelihood of picking a younger side for the clash, we’re certain a number of senior Man United players will still feature in the game, as the manager will be looking to get back to winning ways, and this match could prove to be the key in regaining the squad’s confidence. After finding the back of the net twice in three Premier League appearances, Marcus Rashford could find himself in the starting line-up; playing against a lower side like Northampton could see him score yet another goal as he bids to become a regular in Mourinho’s side. Open an account with Paddy Power today and bet on the Red Devils to seal a victory against Northampton with Man United Enhanced Odds! Bet now with Man United Enhanced Odds!